Terry Southern is an American novelist, Academy-award nominated screenwriter, and even later did writing for Saturday Night Live. 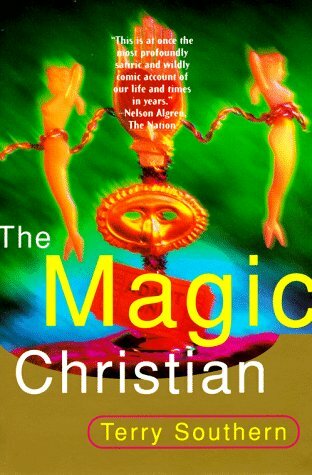 He is praised for his satire and humor, and “The Magic Christian” has no shortage of luminaries singing its praises. The novel revolves around Guy Grand, a billionaire who likes to spend his money to show how far people will go for money. He says everyone has a price, and he intends to find it. Would you eat a parking ticket for a few thousand dollars? Grand finds out, although whether or not that really says anything about the moral character of the individual is questionable. Would you swim in a cesspool of toxins for thousands? Again, he is trying to push the limits on how far one will go. This is an interesting concept, but the point is quickly made, and so even this short novel becomes repetitive. Grand sets up a prank, we see the event occur, and then it is done. In between we are part of his conversation with this two live-in aunts and a desperate, socialite. Then back to another prank. While this repetition is tiring, it becomes irksome because many of the pranks say nothing about our moral limits. At the end he opens grocery stores, sells everything at loss in one night, closes it, and does it again. What does that say about anything? The same works for “The Magic Christian” prank, which is the name of an ocean liner he buys and refurbishes as an incredibly high end travel liner. Those lucky enough to get a place, gradually find themselves on a boat with people intended to make them feel uncomfortable, nothing to eat but potatoes, and a host of other problems. To what point? This says nothing about people and their moral limits. It does say something about Grand. Grand himself is an interesting character. He sets up these elaborate plots for his own humor and often takes part in them, although unknown to others in the crowd. He clearly delights in making people uncomfortable. However, at times he is simply sadistic, which makes this his moral challenging of others questionable. Plus, he has no hesitation is using others, especially the disadvantaged, to meet his needs. He puts circus people on his liner and sends the bearded lady in to the dining room, naked. Funny? Well, to him perhaps, but only it only demeans her and embarrasses others — there is no moral lesson for others here. So, could Southern be actually hoping to have Grand stand in as the satirical character? Is he the one we are supposed to see ourselves reflected in? If so, he fails to make that connection, and as such the book fails. As a short story, this could have some potential, but the repetition and the failure to hold to his own thesis creates an incomplete novel.